My weird brain, and the deal of the century. And yes, there is a missing ‘when’ from that last sentence of my rant. In other news… Tell me what is wrong with this eBay advertisement. as seen from my iPad. Yeah, I don’t think I could beat that ebay price anywhere. I think I’ll bid. I’m surprised no one else has jumped on it, considering this is its third week of listing. Deal of the century. 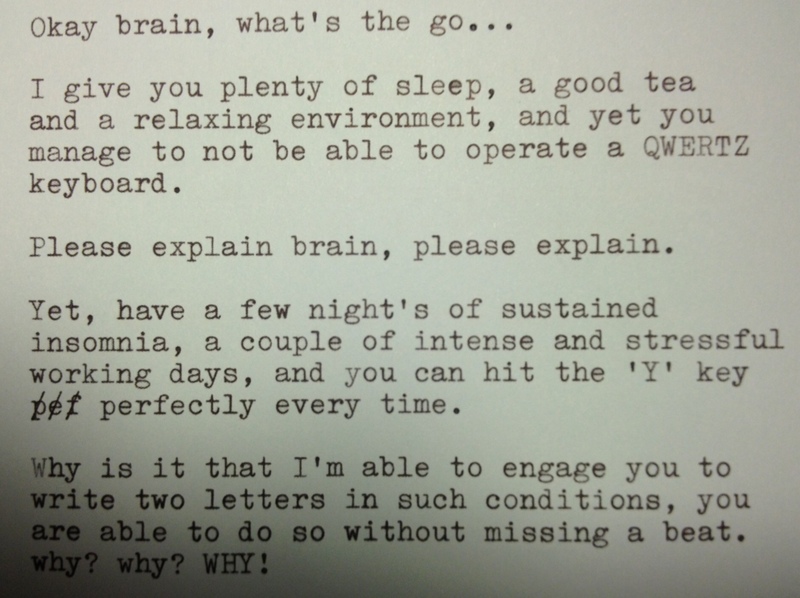 May 29, 2012 in Brain, brother electric, Hermes 3000, QWERTZ, stuff, typewriter, why? Questioning, writing. The Facit that got away. ← Old Machines, new fingers, and a revelation. That's quite a margin (no pun intended) for the seller. 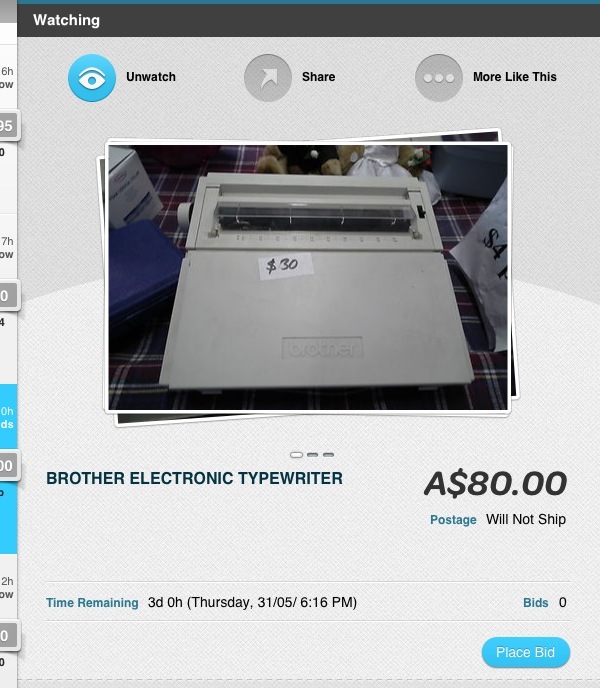 I have never paid more than $5 USD for a modern electric typewriter. Unless Australia is a completely different territory for these that is not a deal. I consistently see these for $2-10 at thrift shops in the states. I think it's incredulous that he won't ship! Honestly, I'm even surprised that I see these electric beasties getting advertised. There's no grace to these machines. I just feel that some people are making some kind of ill-advised 'cashing in on collecting' of these things. I frequently see them advertised at stupid amounts, but rarely stick about to see them sold. I hear people say 'Oh, the elderly still use them'. I'm not so sure that even happens to be honest. Personally, I'm unlikely to touch anything electrical – other than perhaps a 'Selectric'. There's just no… spark. (pun intended). I have sold to the elderly before, but I do agree with you that these machines have little soul. They are fun to use though, any collector ought to have at least one. Just wait until you can get one for $5 or less.